Although educators and parents may have a reasonably good knowledge base about how children learn, it is important to understand the effect that disabilities have on a individual's ability to learn. His or her own combination of special needs impacts the motor and sensory pathways in a unique way. The materials used to provide an Active Learning environment must reflect all of the modalities for learning including sight, touch, auditory, taste, smell and movement with adaptations made to accommodate limitations in any area. In this video clip shared by SKI*HI Institute we can see how a toddler with visual impairments is able to explore and experience objects while at the same time enjoying "play" and building fine motor skills. 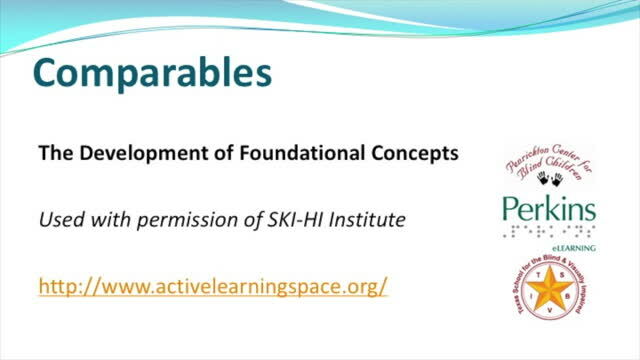 Description: In Active Learning, foundational concepts are developed through exploration of similar objects. This video, produced by SKI-HI Institute, demonstrates how a young boy with a visual impairment explores the properties of similar objects. A typically developing baby is constantly moving, touching, mouthing, smelling, looking, and listening. A child spends a great amount of time in the first two years of life playing, experiencing and exploring with toys and objects. It is the method by which all humans develop foundational concepts. Through play, a child learns about size, shape, temperature, texture, flexibility, and density. A child gains cognitive skills such as spatial relations, object concept, object permanence, and begins to develop problem solving skills. A child will learn about the function of an object, compare qualities, understand quantity and begin to develop language skills. The individual with special needs must also have opportunities to master these skills, an Active Learning environment will provide this opportunity. In the images above, a young boy examines sets of objects: a variety of different types of small balls on the left and a group of different hair rollers on the right. Exploring them and playing with them allows him to compare them and learn about their various properties. (Watch the video to see him playing with these.) Courtesy of SKI-HI Institute. It is imperative that any Active Learning program utilize a wide variety of objects in multiple quantities. Some of these objects may include common, everyday items, that one might encounter in the home or at school (cups, plates, spoons, brushes, magnets, blocks, musical instruments, tooth brushes, massagers, beads, etc.) Many materials can be gathered from places such as garage sales, hardware stores, fabric shops, musical instrument stores, and the home department of local stores. Other items can by obtained on-line or even from the recycle bin. Creativity is key. Think about an object called a "ball." There are so many types of balls - ping-pong, golf, suction cup, metal, chime, beeper, light-up, wiffle, marble, rubber, massaging, tennis, football, soccer, baseball, bocce, croquet, racketball, and bowling just to name a few. For a learner to understand all of the characteristics and uses of these items, he or she must be able to interact and use all of these "balls." An Active Learning program must provide such opportunities.